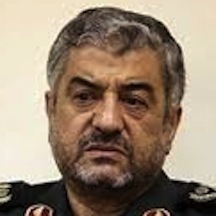 Since 2007, Mohammad Ali Jafari has been the commander“Iran Changes Revolutionary Guards commander: TV,” Reuters, September 1, 2007, http://www.reuters.com/article/2007/09/01/us-iran-guards-idUSBLA16539820070901. of the Islamic Revolutionary Guard Corps (IRGC), Iran’s primary instrument for defending the Islamic Republic against internal and external threats.Greg Bruno, Jayshree Bajoria, and Jonathan Masters, “Iran’s Revolutionary Guards,” Council on Foreign Relations, June 14, 2013, http://www.cfr.org/iran/irans-revolutionary-guards/p14324. Under Jafari, the IRGC has aided Syrian President Bashar al-Assad in his country’s civil warIan Black, “Iran Confirms It Has Forces in Syria and Will Take Military Action If Pushed,” Guardian (London), September 16, 2012, http://www.theguardian.com/world/2012/sep/16/iran-middleeast. and fought alongside Shiite militias against ISIS in Iraq.Farnaz Fassihi, “Iran Deploys Revolutionary Guard Forces to Fight Militants in Iraq, Iranian Security Sources Say,” Wall Street Journal, June 12, 2014, http://online.wsj.com/articles/iran-deploys-forces-to-fight-al-qaeda-inspired-militants-in-iraq-iranian-security-sources-1402592470. Jafari reportedly views Iran’s “internal enemy” as a larger threat than its “external enemy.”Muhammad Sahimi, “A Hardliner’s Hardliner,” PBS Frontline, January 21, 2010, http://www.pbs.org/wgbh/pages/frontline/tehranbureau/2010/01/a-hardliners-hardliner.html. The U.S. and EU accuse him of overseeing the brutal suppression of protesters in Iran“Fact Sheet: New Executive Order Targeting Iranian Officials Responsible For Or Complicit In Serious Human Rights Abuses,” U.S. Department of Treasury, September 29, 2010, http://www.treasury.gov/press-center/press-releases/Pages/tg877.aspx. and Syria.“Council Decision 2013/255/CFSP of 31 May 2013 Concerning Restrictive Measures against Syria,” Official Journal of the European Union, June 1, 2013, http://eur-lex.europa.eu/legal-content/EN/TXT/PDF/?uri=CELEX:32013D0255&qid=1414783825631&from=EN. When he directed the IRGC’s Center for Strategy in 2005,Michael Connell, “Iran’s Military Doctrine,” U.S. Institute for Peace, accessed February 22, 2015, http://iranprimer.usip.org/resource/irans-military-doctrine. Jafari introduced the mosaic defense, a plan that seeks to disrupt an invading enemy’s supply lines by placing IRGC units around Iran’s mountainous border regions.Michael Connell, “Iran’s Military Doctrine,” U.S. Institute for Peace, accessed February 22, 2015, http://iranprimer.usip.org/resource/irans-military-doctrine. Jafari also divided the IRGC command structure between 31 Iranian provinces to give local commanders more control and make it more difficult for an invader to target the IRGC’s command structure.Michael Connell, “Iran’s Military Doctrine,” U.S. Institute for Peace, accessed February 22, 2015, http://iranprimer.usip.org/resource/irans-military-doctrine. Jafari later praised Hezbollah’s tactics against Israel in their 2006 war as an example of non-traditional urban warfare.Muhammad Sahimi, “A Hardliner’s Hardliner,” PBS Frontline, January 21, 2010, http://www.pbs.org/wgbh/pages/frontline/tehranbureau/2010/01/a-hardliners-hardliner.html. Jafari believes in Iran’s military superiority and has been a vocal critic of the West. Jafari has boasted that Iran will send its enemies “to the depths of the sea.”Nazila Fathi, “Iran Escalates Military Rhetoric,” New York Times, August 5, 2008, http://www.nytimes.com/2008/08/05/world/africa/05iht-05iran.15003614.html. He believes the ultimate goal of Iran’s Islamic Revolution is to create an Islamic civilization and that the IRGC will carry out this goal.Thomas Erdbrink, “Iranian General Says Saudi Arabia Will Soon Be Toppled,” New York Times, April 27, 2015, http://www.nytimes.com/2015/04/28/world/middleeast/iranian-general-says-saudia-arabia-will-soon-be-toppled.html?ref=world. In January 2014 amid ongoing negotiations on the Iranian nuclear deal, Jafari told Iranian-owned Fars News Agency, “Mr. Kerry must know that direct battle with the US is the biggest dream of pious and revolutionary people across the world. Your threats offer our revolutionary people the best opportunity.”“IRGC Commander: Iran to Give Crushing Response to Enemy’s Aggression,” Fars News Agency, January 26, 2014, http://english.farsnews.com/newstext.aspx?nn=13921106000769. Aziz Ja’fari“Fact Sheet: New Executive Order Targeting Iranian Officials Responsible For Or Complicit In Serious Human Rights Abuses,” U.S. Department of Treasury, September 29, 2010, http://www.treasury.gov/press-center/press-releases/Pages/tg877.aspx. The U.S. Department of the Treasury designated “Mohammad Ali Jafari” as a Specially Designated National under its Weapons of Mass Destruction Proliferations Sanctions program.“Fact Sheet: U.S. Treasury Department Targets Iran’s Nuclear and Missile Programs,” U.S. Department of the Treasury, June 16, 2010, http://www.treasury.gov/press-center/press-releases/Pages/tg747.aspx. The U.S. Department of the Treasury designated “Mohammad Ali Jafari” under Executive Order 13553 targeting Iranian officials responsible for or complicit in serious human rights abuses.“Fact Sheet: New Executive Order Targeting Iranian Officials Responsible For Or Complicit in Serious Human Rights Abuses,” U.S. Department of the Treasury, September 29, 2010, http://www.treasury.gov/press-center/press-releases/Pages/tg877.aspx. The European Union sanctioned “Mohammad Ali Jafari” on June 23, 2011 for involvement in providing equipment and support to help the Syrian regime suppress protests in Syria.“Council Decision 2013/255/CFSP of 31 May 2013 Concerning Restrictive Measures against Syria,” Official Journal of the European Union, June 1, 2013, http://eur-lex.europa.eu/legal-content/EN/TXT/PDF/?uri=CELEX:32013D0255&qid=1414783825631&from=EN. Since 2007, Mohammad Ali Jafari has been the commander* of the Islamic Revolutionary Guard Corps (IRGC), Iran’s primary instrument for defending the Islamic Republic against internal and external threats. “We will continue to support the survival of the Syrian government [in its fight against terrorist groups] and its sovereignty and territorial integrity and will never allow any partitioning of any of Muslim territories. We view disintegration as a British-American-Zionist strategy, therefore we will never allow any weakening of Muslim nations.”“Iran never to allow Syria partition: IRGC chief,” PressTV, April 5, 2016, http://presstv.ir/Detail/2016/04/05/459289/Iran-Syria-IRGC-Jafari-missile/. “We firmly announce that the Islamic Iran has not enjoyed such defense and security power and capabilities and prepared forces in different social arenas any time before.”“Islamic Iran More Powerful than Ever: IRGC Commander,” Tasnim News Agency, September 16, 2015, http://www.tasnimnews.com/english/Home/Single/861200. “With all of our ability, we will properly guard the principles, values and achievements of the Islamic Revolution, and we will never allow those opposed to this divine path to pave the way for the enemy.”Arash Karami, “Khamenei asks IRGC to prevent ‘enemy’s influence,’” Al-Monitor, September 16, 2015, http://www.al-monitor.com/pulse/originals/2015/09/khamenei-enemy-irgc.html. “Exporting the Islamic Revolution to the world, the country's full and sustainable security and its pride and honor are the achievements gained as a result of the blood of our martyrs.”“IRGC Commander: Iran Prevents Expansion of Zionist Regime in Region,” Fars News Agency, October 21, 2014, http://english.farsnews.com/newstext.aspx?nn=13930729001391. “Now the Islamic Iran doesn’t allow the Zionist regime’s expansion in the region and it is considered as the opposite point of the Zionist regime.”“IRGC Commander: Iran Prevents Expansion of Zionist Regime in Region,” Fars News Agency, October 21, 2014, http://english.farsnews.com/newstext.aspx?nn=13930729001391. “We have no doubt that one day we will be in war with the sworn enemies of the Islamic Revolution in the region, of course, we will not be the initiator of that war. This battle will take place and hence we should be fully prepared for that day.”“IRGC Commander: Enemy May Not Dare to Attack Iran,” Fars News Agency, August 30, 2014, http://english.farsnews.com/newstext.aspx?nn=13930608001690. “We are prepared to back the resistance movement until Palestine is liberated.”IRGC Vows to Continue Backing Resistance Movement till Liberation of Palestine,” Fars News Agency, August 29, 2014, http://english.farsnews.com/newstext.aspx?nn=13930607000523.